The Real Estate Marketing Alliance, also known as REMA, combines the talents and services of three companies: Parker Associates, REDdot Marketing, and PTC Computer Solutions. This Alliance is designed to provide a complete marketing and sales support team for the benefit of not only master planned community developers and existing developments, but any business who is in need of a complete marketing and sales process and system as well as budget and planning flow. Contact REMA for all your marketing and sales needs through any of the three companies listed. PTC Computer Solutions of Jacksonville, Florida has been retained along with REDdot Marketing also of Jacksonville, Florida to redesign the existing web site content for Connestee Falls, located near Brevard, North Carolina. Connestee Falls is a gated community with the perfect location for a permanent or second home. The homes there range from cozy to spacious. Choose from an existing home, or buy a lot and let one of the local builders help design a unique new home that meets your exact preferences and lifestyle. There are a variety of homesites available directly from the property owners association. Either way, you will be surrounding yourself in a uniquely beautiful mountain setting where people live in harmony with their neighbors and nature. Connestee Falls is a perfect example of where the housing market has been going in the past few years. With developers reticent to begin new master planned community and planned unit developments, there is no question that an existing community with existing infrastructure, amenities, and a homeowner base is an excellent opportunity. Not only do the homeowners benefit, but the whole community benefits from filling those vacant remaining lots as well as resales. Increased value and rediscovering existing communities is a win-win situation for everyone involved. If you are looking to get noticed on the Internet but don’t know where to begin, let PTC Computer Solutions help you get started or help improve your current website and website marketing plan. We can plan a full budget for your company and complete any web marketing efforts you wish to achieve to deliver a consistent and effective message to your prospects. Contact David W. B. Parker (when you think of “W. B.” think of WeB) at davidp@ptccomputersolutions.com or go to www.ptccomputersolutions.com for more information. Thanks for letting us know about web developing the http://connesteefalls.com/ website. It is an excellent graphic design and backend web programming obviously full of database interaction. The fact that you are based in Jacksonville, Florida but have website designs and have developed websites all over the world, including Brevard, North Carolina, is an excellent testimony to your flexibility in the web design and development community. Well Done!!! I have read a variety of engaging posts here. I think you can make ptccomputersolutions.com a viral blog cast. Blogging for your clients is an important part of social marketing and PTC Computer Solutions definitely knows how to generate buzz to enhance the site to go viral. Thanks. Connestee Falls is a community I’ve been looking at for a long time. The website design and development that PTC Computer Solutions completed for the website is outstanding. Obviously, how you do the SEO for Connestee Falls allowed the search engines to rank your community high up there so I could find you. Thanks to the Jacksonville, Florida based web designer on this North Carolina mountain community in western North Carolina near Brevard, North Carolina. Connestee Falls of Brevard, North Carolina is a community in western North Carolina’s hills. 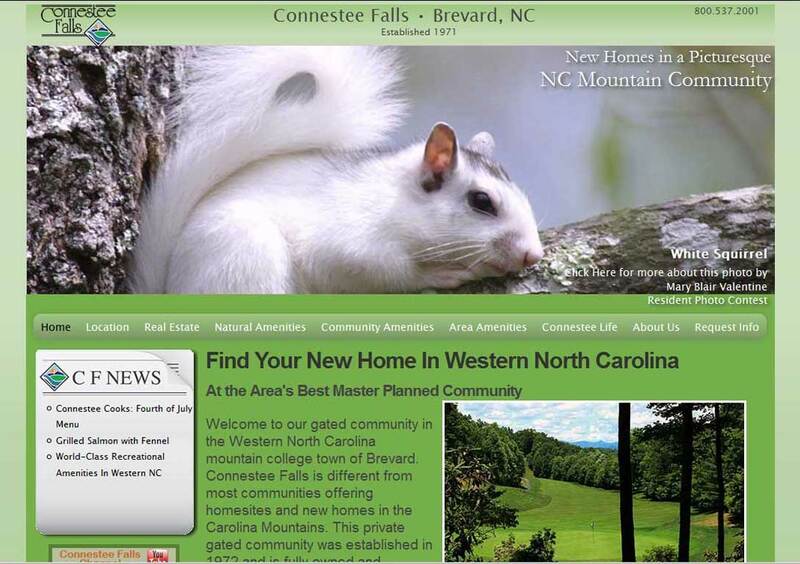 Connestee Falls has been an outstanding master planned community development in western North Carolina since the 1970s and has a multitude of new home lots available for you to build your new home. PTC Computer Solutions has developed a premier website design and developed a marketing campaign focused on attracting homeowners from around the east coast interested in a new home community equipped with all the amenities of an established golf course community in western North Carolina. Contact Connestee Falls at info@connesteefalls.com for more information or PTC Computer Solutions at info@ptccomputersolutions.com if you are interested in your own quality website design and marketing plan to re-invigorate your community development.